Lena and Boris Nikitin from the village Bolchevo close to Moscow are famous Russian parents, and their seven children are really something. For Alexei, 16 years, Anton, 14, Olga, 13, Anja, 11, Julija, 8, Ivan, 6, and Ljuba, 4 years, are recognized as wonder children. With 15 Alexei began a teaching degree, Anton made his Abitur with 13 (instead of 17), Anja skipped the fifth grade, and with 7 years Yulia made a jumpstart in the fourth grade. And little Ljuba can read and write. However Exceptional academic performance is not the only feature of Nikitin children. They are bursting with health, are almost never sick, and five of them have never needed a drug. Their bodily skills are outstanding too. With four they could walk twenty kilometers a day on foot. The eight-year Julija repeated last year her personal record in a ten-kilometer run. These successes are not a result of a special dressage, but a system of early childhood education, which differs considerably from the usual methods of private and public education. The parents Nikitin had namely observed that most children suffer from the sudden transition from the playful insouciance of early childhood to the harshly regulated school life. By the late fifties Boris Nikitin did utilize this experience in practice. Together with a group of other teachers, he asked the municipality for a school, a piece of land and money to set up a new community, modeled after the Soviet educator Anton Makarenko, who had founded Children colonies in the twenties. The project did not materialize. The Nikitin had no choice but to develope their ideas within their own families. Just a few days after birth, they started working systematically with the children, but in a playful way. It was based on the now undisputed knowledge, that the foundations for a child’s development are made within the first three years of life. They tried to make the study of the little ones from the outset as versatile as possible. The key to the system «earlier and age-appropriate education» – as the Nikitins call their experiment – is the simultaneous development of mind, body, soul, feelings, will and morality. Already in the first weeks of life Nikitins babies used the potty. This early lessons payd off: mother Nikitin has ten to fifteen times less diapers to wash than other mothers! With three months the children had rings hung over the cradle. Within a short time they were able to lift themselves for half a minute. At the age of two to three years the children swung with one hand on the speech and could carry loads of the size of their body weight. They were ten to fifteen times less ill than their peers and if so much easier. The early development of the child’s mind was fostered by the parents through an «enhanced educational environment». The children nothing but the toys, which their parents developed and custom built. In the courtyard of Nikitin are gymnastic apparatusses, in their workshop there are worktables and tools of various sizes. In addition to the staircase leading from the ground floor to the first floor of the house, a metal rod is attached. Particularly the smaller children spend time here. In the rooms are books, maps and blackboards around. In this environment the children learn playfully. With three or four years they could read and count; write at the age of four. At the age of five and six they could understand plans maps and sign templates. Accustomed to look at every job and every operation as a game, learning is not a burden or even a duty. There is no schoolwork to do, because they have done away with the curiculum in advance. Visitors found the Nikitin Children very inquisitive and able to concentrate. They have a quick mind and a very good memory. To the parents the most difficult task appeared to be the chapter of moral and moral education to which Lena Nikitin was most dedicated. She makes sure that everybody contribute to the housework. The kids help with cooking, baking, washing and cleaning, and learn to do unpleasant duties. The pedagogically interested public of the Soviet Union observed Nikitins experiment for ten years with interest. But so far, pedagogues, sociologists and physicians dont really know what to think of this experiment. 1965 a commission of the Moscow Institute of Pediatrics rejected the «unwarranted experiment», because this «unsystematic education contradicts all theoretical and practical knowledge of medicine and education». The doctor Professor Ilya Arschawskij, who regularly observed and examined the Nikitin Children through ten years, also stands behind this «unusual family experiment» and attested it as «tremendously important for our country and for the understanding of legitimate physical and intellectual education of our children» , «No abnormalities» in the development of the seven Nikitin children was ever observed by the doctor. Public opinion is divided. Some defend themselves against experiments with children, because children are not guinea pigs. 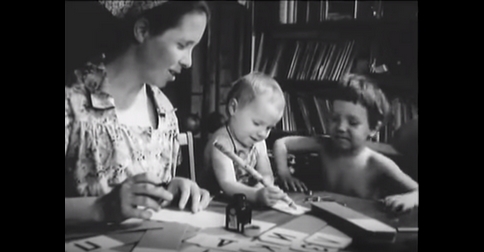 Others consider the «planned education of gifted children» was nothing but a lucrative business of their parents, because they wrote a book ( «Are we right?») and appeared on television. But Nikitin didnt get one ruble for the appearance on camera. They lived from the money they earned on regular work: Boris Nikitin as an educator and Lena Nikitin as a librarian. Really nothing extraordinary. Is the experiment of Nikitin a «lever of Archimedes», («Give me a place to stand and with a lever I will move the whole world») as the Moscow intellectuals Journal Literaturzeitung wrote about the controversial family? The success seems to give Nikitin and not their critics right. The children are not precocious, small adults, not small machines crowded with knowledge, but cheerful, exuberant «brats» who act according to their age childlike and playful. The alleged overloading of children, the main accusation of critics, is not perceived as such. On the contrary, the «early and all-round development» assures the children extra health, extra menthal and physical energy, but also leaves them enough free time to do as they please. They do not suffer the tension that burdened many students in the school. The parents hope, that the children, when grown up, will be able to work more creatively than executive. For now, experts even argue about how much is in each case the proportion of congenital talent and the proportion of personal qualities of their educators. But in order to realize this, the experiment should be repeated on a large scale with several hundred children and under scientific control. So far only one pre-school education by the methods of Nikitin is tested collectively. Boris Nikitin worked on this project for eight years as an educator, although he is by profession an engineer. And the success speaks for itself. The children develop twice as fast as their peers at public or private oversight. Recently family sociologists of the Academy of Pedagogical Sciences took the Nikitins under their wings. They want to find out what benefits the community may draw from the «early and all-round education» in the long term. «If it turns out, that not innate talents, but the methods of the Nikitins is the genuine cause of these wonderful results, then they could, so hope sociologists, become the new agent that heals of the new diseases of our time, an antidote to the information explosion». This will, they both point out, become increasingly important, as the technical-scientific revolution is being deployed, and constant teaching and continuous learning becomes the fate of most people. The peculiarity of the early development of the Nikitin family.